Cockroach extermination or cockroach stomping is the method of killing Cockroach Soldiers. 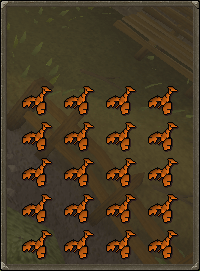 They are some of the best monsters that a RuneScape player can train on. Commonly known as "Roach", these level 83 monsters are slowly rising in demand because of the drops they give. In this guide, I'll be instructing you on the best way to beat them and score some hot rewards! They give great xp, but are slower than training on others. They drop lots of runes, gems, ores, and in addition, often drop rune armor and weaponry, such as Square Shields and Scimitars. Another upside to them is that they are very close to Edgeville bank. Since they are located in a multicombat area, you can bring your friend or clan to fight them with you. One thing that players fighting this must know is that they often hit between 80-110 Life Points of damage, have comparatively high Defence (more than giants) and have a very high Magic Defence. The best method to fight them is melee. Maging them is not recommended. Range works on them too, but not as great as melee. 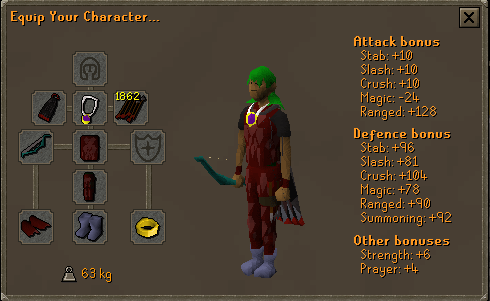 The best d'hide vambraces/Gloves you can get. Keep some space for the loot. Note: It is said that they are weak to crush attacks. 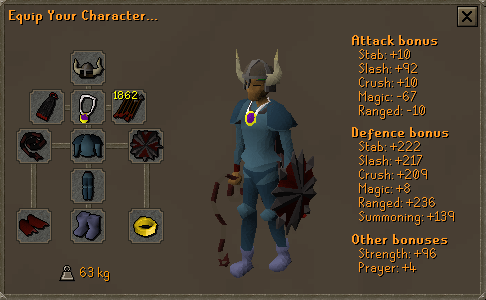 So you can use Warhammers and Battle axes and use their crush attacks. But do not use 2hs. They provide lesser Defence and so you will lose more hp than those with shield. Maces also can be used as they are fast and have decent strength. But I say the best is still Scimitar and Longsword. 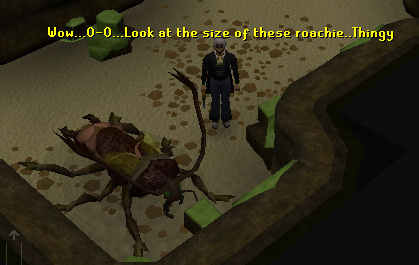 The only place that cockroaches are found is the Stronghold of Player Safety. The Soldiers are great in numbers and are not aggressive. So you can rest a little bit before jumping into fight them. But remember they are multicombat. To enter the stronghold, you must first complete the exam at the exam center (its like a mini-quest). Then enter through the tunnel behind the poster in the empty cell. After you climb this rope for the first time, you will be able to use the crevice entrance for a shorter way to the roaches. 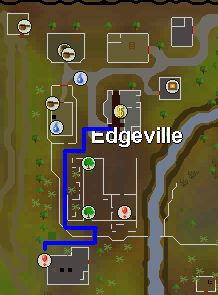 The bank closest to the stronghold is the Edgeville Bank. 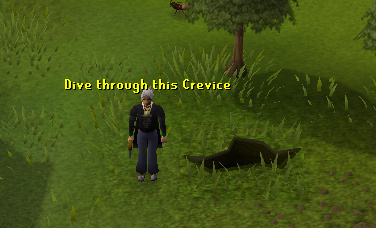 Run south after banking, to the crevice below the yews, marked by the Dungeon Entrance icon ( ). 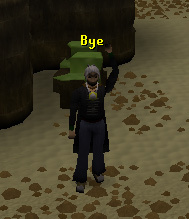 Alternately, members can use the glory amulet to teleport to Edgeville and then run to the cockroaches from there. 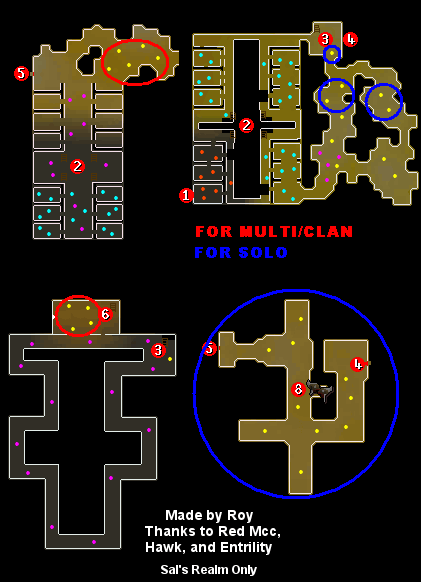 The following is a map of the stronghold, with areas for soloing and teaming cockroaches circled. For melee, there is no specific strategy to fight them. Just fight like you usually do. Range is not as effective as melee. This is because cockroaches have Range as well as melee attacks. But rangers must only attack those roaches that are already attacked by others. You must multi them, that is. This will probably make others angry at you. But if you find someone who agrees to this, then good for you. Just don't be the one to start the fight with the Roaches. Alternately, you can use crossbow and bring some shield that reduces your range less than others and attack them close by. 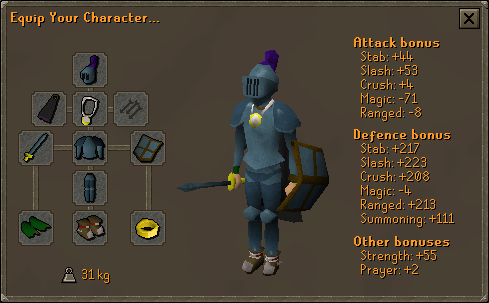 For this, I recommend you use some of Karil's armour (if you can). But you can still stick with multi-fighting them with the crossbow. 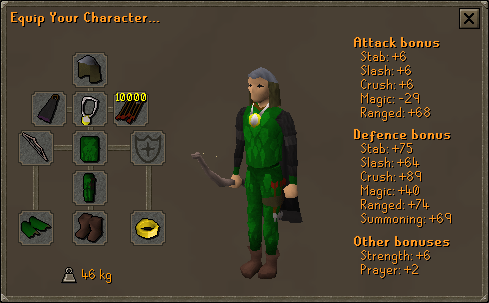 Prayer and potions are not really needed. Warriors can use them to boost their stats while fighting. Rangers need them more than warriors because they have lesser Defence than warriors and hit less and less often than the warriors. The potions that can be used include Supersets or range potions. Note: You can use this same strategy for fighting cockroach workers. I hope this guide has been of some use when fighting cockroaches.